In Sarah Gilbert’s latest work, Signs and Signifiers, Sarah explores ideas of way-finding—both in our species and beyond. She talked with us about how she found a home in Tacoma, and how she employs centuries-old techniques on equipment from another place and bygone era. Five days a week, you will find Sarah playing with fire. The job is physical; she’s a full time glassblower at Tacoma’s Museum of Glass and works alongside visiting artists to turn their ideas into crystalline reality. One could use the analogy of a house band to describe her day job: other artists bring the sheet music and she plays the notes to make the song. She loves her job, she says, she loves her team. And she loves the mix of the heat and hard work of the hot shop during the day contrasted to the quiet, meditative environs of her basement studio when she returns home to work on her own projects each day. After a long day in the hot shop, Sarah returns home and tries to squeeze in a few hours of her own work. Her studio lives in the garage. Shelves filled with micro machines and friendly ephemera line the walls, along with sketches of her projects in-process, a childhood school picture of her wife, and glass baubles and art. On one wall sits an antique lathe from the Czech Republic. “Somebody used to use that to make a living,” she says referring to the lathe, a bit in awe. The lathe uses coppers wheels to engrave on glass. Little wheels in different shapes and sizes sit atop it. Her latest work uses a technique called cameo engraving. “It’s an old technique that you see in old vases or your grandma’s brooch. There’s usually a white layer of glass over a colored layer, and you’re removing that white layer to create shading for the imagery.” She’s been working with this technique for five years now, and describes the steep learning curve that she’s experienced along the way. “I’m still learning,” she says, but considers the technique a breakthrough in her work: “It’s a whole learning curve that they didn’t teach me in school. It’s a pretty obscure and antiquated thing to get into, but it’s been a huge discovery for me.” The exercise was really attractive to her as a way of getting her drawings on to the glass. “It’s been a bit of a breakthrough to find that process.” She says that some people might not see the value in using this machine, but she’ll use it the rest of her life. 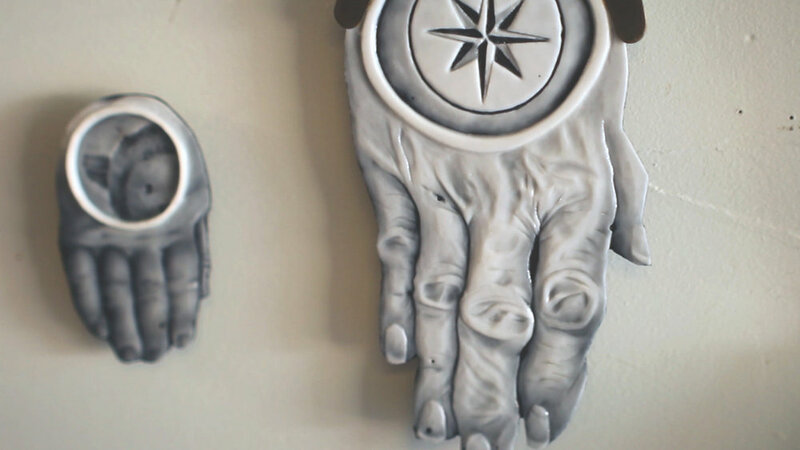 A pair of hands from Signs and Signifiers. Sarah’s work from Signs and Signifiers is currently on display at The Glass Factory in Sweden for Young Glass, a juried traveling exhibition with 60 works by young international glass artists, and on her website.